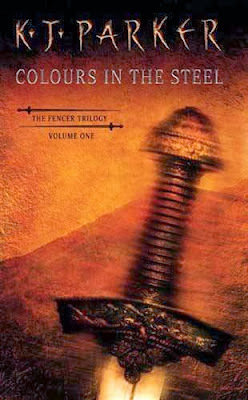 You can still download K. J. Parker's Colours in the Steel for only 2.99$ here! An epic novel of blood, betrayal, and intrigue. . .
Perimadeia is the famed Triple City and the mercantile capital of the known world. Behind its allegedly impregnable walls, everything is available-including information that will allow its enemies to plan one of the most devastating sieges of all time. The man called upon to defend Perimadeia is Bardas Loredan, a fencer-at-law, weary of his work and the world. For Loredan is one of the surviving members of Maxen's Pitchfork, the legendary band of soldiers who waged war on the Plains tribes, rendering an attack on Perimadeia impossible. Until now, that is. But Loredan has problems of his own. In a city where court cases are settled by lawyers arguing with swords not words, enemies are all too easily made. And by winning one particular case, Loredan has unwittingly become the target of a young woman bent on revenge. The last thing he needs is the responsibility of saving a city.